This has definitely been the year of all things Harry Potter in our lives. I’ve been reading the series to Lucas for more than a year (we’re about half way through the Half Blood Prince), and our trip to England last summer was pretty much based on cramming in as many Harry Potter references as we could manage, including a visit to the Harry Potter experience at the Warner Bros studio. 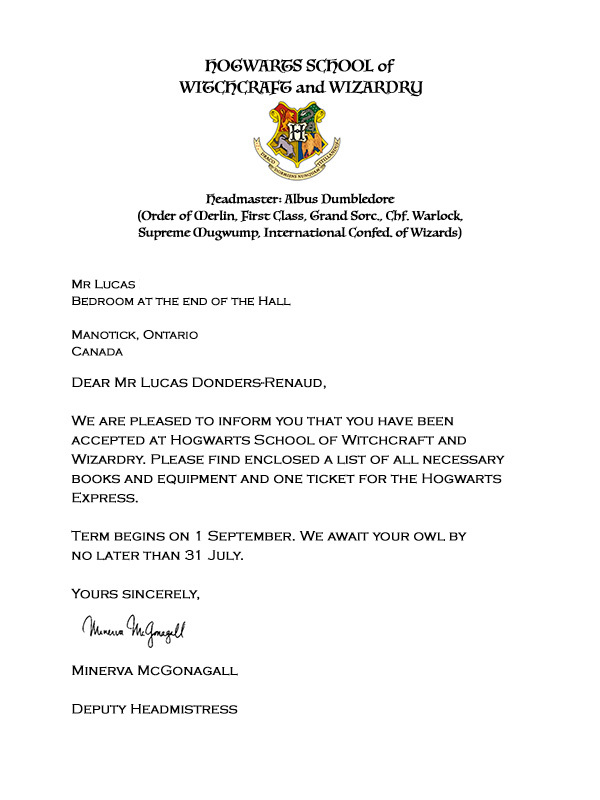 And since Lucas turned 11 years old this week, it seemed only fitting that he receive his official letter of acceptance from Hogwarts. It was surprisingly easy to make our own custom, personalized acceptance letter to the famous school of witchcraft and wizardry! The Harry Potter wiki gave me the wording I needed. I found the Hogwarts logo on the wiki and used it for the header. It was short and simple, so I decided to add the second page with required list of supplies and books as well. This time I used the Hogwarts crest as a watermark. The wiki even had the signatures for Professor McGonagall and the Chief Attendant of Witchcraft Provisions. Details make the illusion hold together! I picked up a small pack of parchment-like paper at the stationery store, but you could easily print it on regular, thick paper and use a wet teabag to give it a little colour and character or even burn the edges a bit. The fonts, in case you were wondering, are Luminari for the Hogwarts header text and Copperplate Gothic Light for the body text. The question of how to deliver it was a little bit trickier. Dangling in the fireplace seemed like a fun but potentially messy option. When I started thinking about owl post, my first inspiration was borrowing an owl stuffie from friends, and then I realized that all three boys are collectors of the Funko POP figures, and a plan was born. 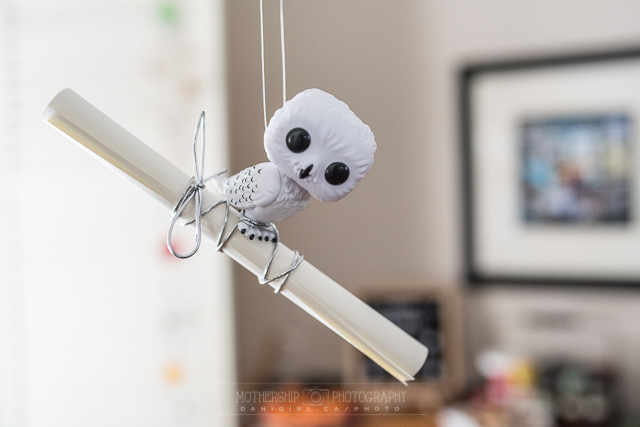 A little fishing line, a bit of shiny ribbon and the chandelier helped our new Hedwig POP figure deliver the scroll tied to her ankle containing the letter from Dumbledore. She’s a little small. In truth, she looks more like Pigwigeon than Hedwig. But, she did an excellent job delivering the letter, right at the beginning of Lucas’s birthday party. His friends noticed her before he did! I love the look on his friends’ faces! If you have any questions about how we pulled this together, or suggestions that will help someone else do a better job, please don’t hesitate to comment! Remember this? 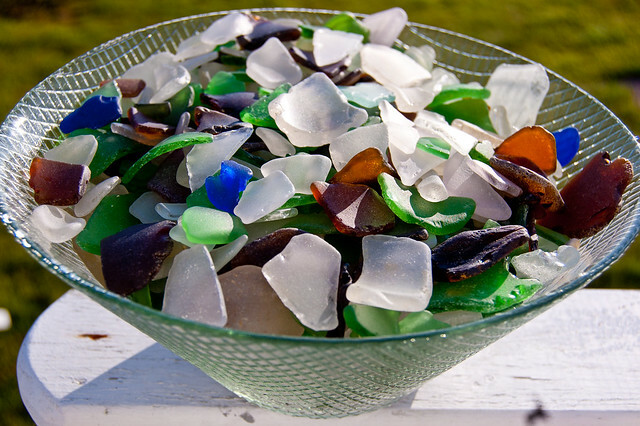 This was the bounty of sea glass that turned us into junkies way back in 2010 on our trip to Nova Scotia. Since then, we’ve added to our hoard from PEI to Vancouver’s Stanley Park, but I never did do anything more creative with it than keep it in glass jars stashed around the house. Not even terribly nice glass jars. Oh the shame! Every now and then I’d pull it out and sort through it, feeling rather like Gollum muttering “my precious sea glass” as I sniffed the last vestiges of salt from the pieces. Three things happened to inspire me to finally do something with our collection. The first was adding to our collection in Souris, PEI. The second was a bit of spare time on my hands, thanks to the vacation entitlement that comes with 24 years of service. And the third was — Pinterest. 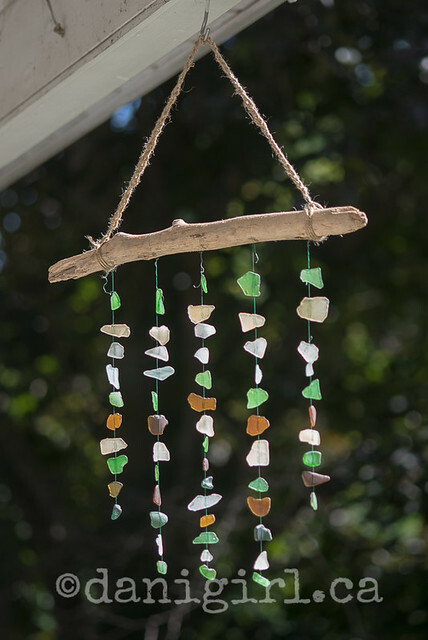 One day it occurred to me to search for sea glass crafts on Pinterest and I was immediately smitten with the idea of a sea glass mobile. I didn’t want to start drilling the glass or playing with wire (although I’ve still got a LOT of sea glass so I’m not ruling that one out!) but I did love the idea of simply using string and glue. Easy peasy, right? Of course, actually executing the plan turned out to be a lot more complicated than I’d anticipated. I set out to get some stretchy filament like you’d use in making a bracelet from the Sassy Bead store downtown. The clerk there recommended against stretchy filament (more prone to breakage) and instead sold me a couple of meters of what seemed like very fine fishing line. I also picked up some E6000 adhesive. I’m not sure where I got that idea from – probably a random Pinterest link. The idea was to tie a piece of glass, tap in a blob of E6000 to hold the knot, tie on the next piece, etc etc etc. Ha. Not so much. The fishing line nearly drove me batty as I tried to tighten and knot the loops around the sea glass. I tried on two separate occasions to make it work, and got frustrated before I could get three or four pieces on the line. Finally, I reached out through Etsy to Rebecca Long, whose work had inspired me in the first place. She was nice enough to point me in the direction of this episode of Martha Stewart Living (confession: first time I have every watched this show!) 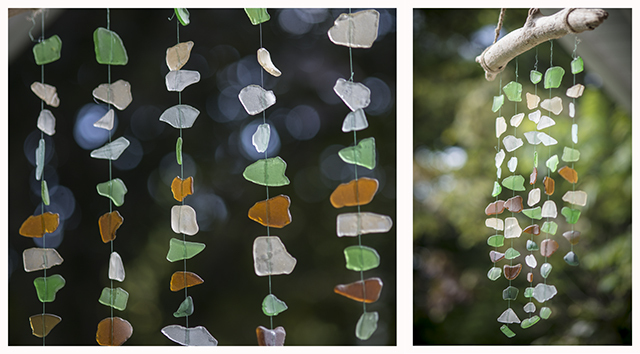 with a sea glass mobile tutorial. use a glue with a built-in brush. I gave up on E6000 and a tooth pick in favour of Lepages with a brush and it made a world of difference. And miracle of miracles, I did not once glue my fingertips together. 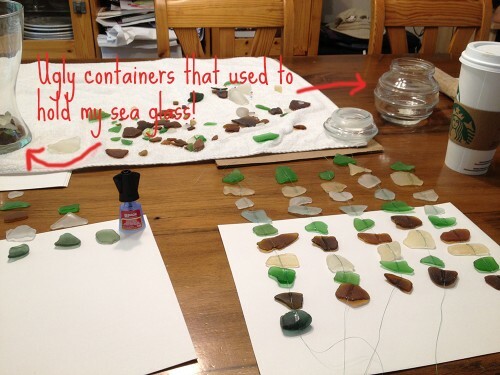 lay out your pieces of sea glass ahead of time. leave twice as much of a lead (for tying to the driftwood or other frame) as you think you will need, and then double it again. take your line and make a simple loop over your fingers, pulling the end through the loop to start a knot. Slip your fingers out and the glass in, and make a knot tight against the top of the piece of sea glass, then fold the tail down alongside the thread. Brush from the knot to the bottom of the glass along the two threads with glue. move on to the next line and repeat on all your threads, then go back and put the second piece on the first thread. In the end, I bought three types of twine and two types of glue, and it took about four hours of futzing about before I finally started making progress. What you see here actually only took about 60 minutes, once I got a good rhythm going. I love how it turned out! That’s an authentic piece of PEI driftwood, by the way. I picked it up exactly with this purpose in mind. I also found a better way to store the left-over sea glass. Did I mention I have a new addiction for vintage mason jars? Once I got the details sorted out, this was a surprisingly easy craft – what a great way to show of your summer treasure, right? I was thinking the other day how great it is to be out of the nap zone with our kids. It used to be tough balancing playtime for the bigger kids with nap time for those who needed it. When my friends at Fisher-Price suggested a post on summertime fun this month, I thought it would be great to have a few suggestions for backyard fun you can set up for your older kids while the wee ones nap. This works well with a kiddie-sized swimming pool but you can also change things up by filling up a largish plastic sweater box with water, some bubbles and a few favourite bath toys. HOURS of entertainment, I kid you not. The Floating Island Bathtime Adventure is great for this, and the Little People always seem to enjoy a swim. Send your future photographer out to document the progress of your flower or vegetable garden, or the dandelions, or whatever else is out there. 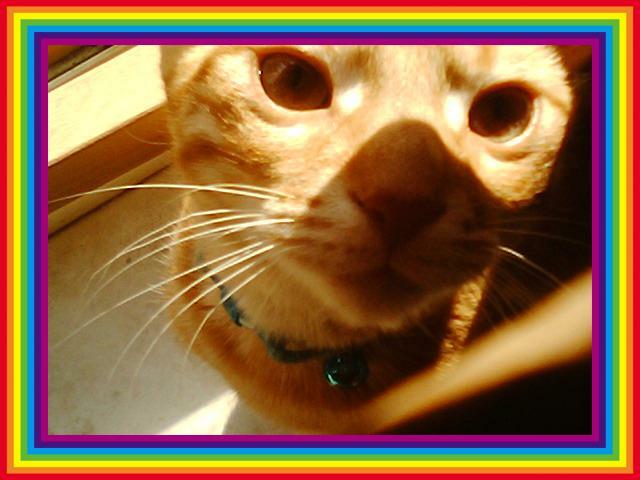 It’s no secret we love our Kid-Tough Digital Camera! For extended play value, encourage the kids to help you in the set-up of a backyard obstacle course. Jump off the table, kick a ball as far as you can, ride your Kid-Tough trike in a circle, do a somersault across the grass, weave between a row of lawn chairs… and freezies as a prize for all competitors! 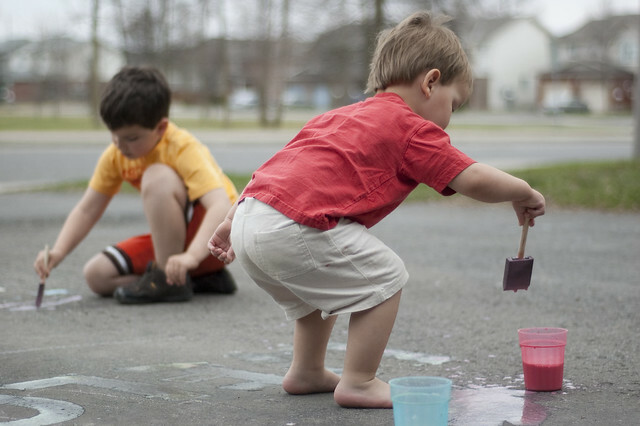 My kids never get tired of drawing on the driveway, the sidewalk, the side of the house… but now that I think of it, it has been way too long since I brewed up a batch of sidewalk chalk paint! If just drawing pictures doesn’t engage them, you can always draw up a hopscotch or four-square board, or play “copy this letter”, or trace their outlines and let them colour in their own lifesized-selves. Find five or ten small toys and hide them around the backyard. Give your seeker a basket or container to collect them and guide him or her by saying “getting warmer” when they get close or “getting cooler” when they get further away. Or, hide a small cache of something and draw up a treasure map where X marks the spot. 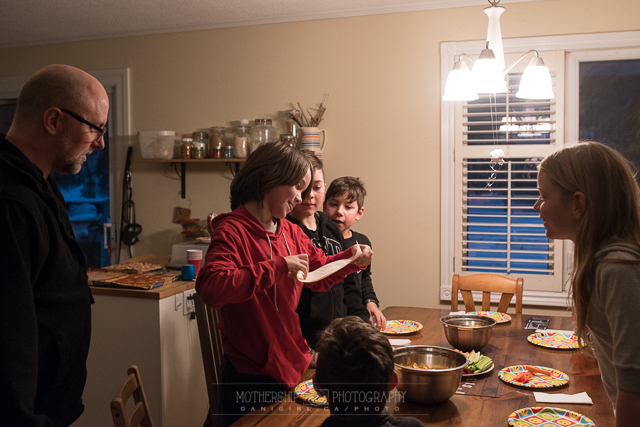 We had a nanny who would make up a series of clues and hide them in sequential order all over the house, leading to a craft kit she would do with the boys – she was a terrific nanny! While I don’t miss having to juggle nap times for the boys, I kinda wish we had more nap times for grownups built into the day! What do you do to entertain an energetic big kid while the wee ones are napping? Disclosure: I receive special perks as a part of my affiliation with the Fisher-Price Play Ambassador program with Mom Central Canada. The opinions in this blog are always my own. This is a shameless but absolutely unsponsored plug for a great summer activity for kids aged 8 to 12. It was Beloved who noticed the ad for free kids’ camp on the Apple.ca website a few weeks ago. I think it’s a bit of a stretch to call it “camp” as the sessions are only 90 minutes over three days, but if you are looking for an amazing free (did I mention free?!) summer activity for your preteen kids, check this out! At Apple Camp, kids ages 8-12 learn how to shoot their own footage, create an original song in GarageBand on an iPad, and put it all together in iMovie on a Mac. This free workshop, held at Apple Retail Stores, spans three days and ends with campers debuting their masterpieces at the Apple Camp Film Festival. They didn’t need to bring any equipment of their own, although they both brought their own iPods and used them to capture the raw footage. You don’t need any Apple devices to attend the workshop, but be prepared to covet one if you don’t have one. We had iMovie for the iPods already (annoyingly not the same as the iPad version Tristan had used with a friend to make movie trailers a few weeks ago) and although I have Garage Band for my Macbook it is apparently not the same Garage Band as the one for the iPad. (Which we had to download because it is a wicked cool app, so we were in for $5 by the time the dust settled.) That’s my only complaint about the whole process – the difference in apps across devices confused the heck out of me. But that’s an Apple problem, not a workshop problem. Curious? Here’s the final cut! Not bad for a couple of hours, eh? I think they did a great job and I know they had a great time. In addition to the experience, they got free t-shirts, USB wrist bands and iron-on patches. For FREE! Mad props to the Apple store for this program. It looks like they’re offering more workshops at the Rideau Centre and Bayshore Apple stores the last week of July – check with Apple.ca for a location and date near you! I love this, because I think each and every one of these is an excellent activity — and yet it makes me sad and kind of tired. Do we as parents really need to make an itemized checklist of experiences our kids must achieve? Meh, maybe the grey Ottawa skies and cold, damp temperatures are making me cantankerous. It actually sounds like a road map to a pretty great summer, if spring ever decides to return. 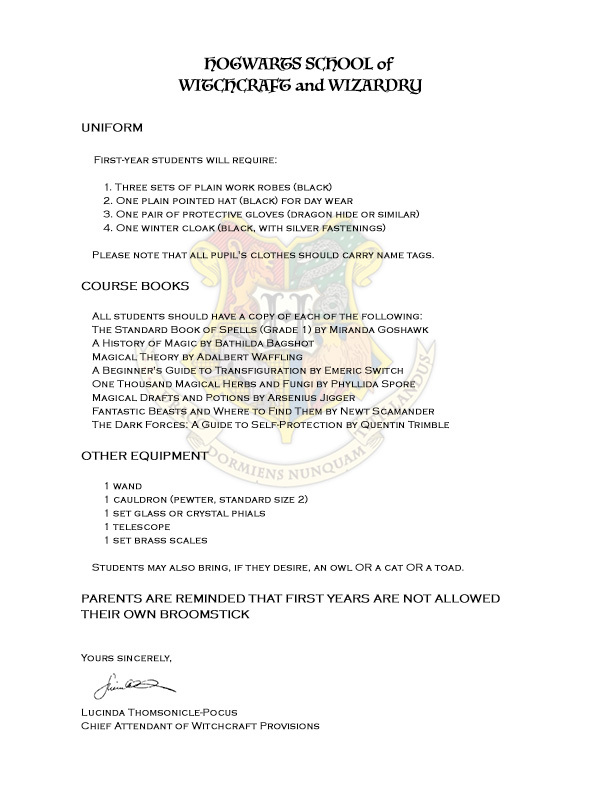 I figure the boys have a good half of the items crossed off, and I can tell you for sure I won’t be taking them abseiling any time soon – although the zip-line at a local aerial park is not out of question. What do you think? Is there anything on here a child of 12 can or cannot live without doing? Something you’d add to the list? It’s a snow day here in Ottawa today. The buses have been cancelled and while the schools are still open, we’ve decided to let the boys stay home. I usually ship ’em off as even in the most treacherous conditions I think they’re better off for a few hours at school than at home, but by a fluke of scheduling both Beloved and I were home anyway, so we let them stay home for a treat. Now that the kids are older, they’re better at entertaining themselves even on a long day at home. They like to play board games, and we’ve always got a craft of some sort on the go. And of course, there are the ubiquitous video games. Snow days are such a break from routine that it’s fun to find something unique to do. 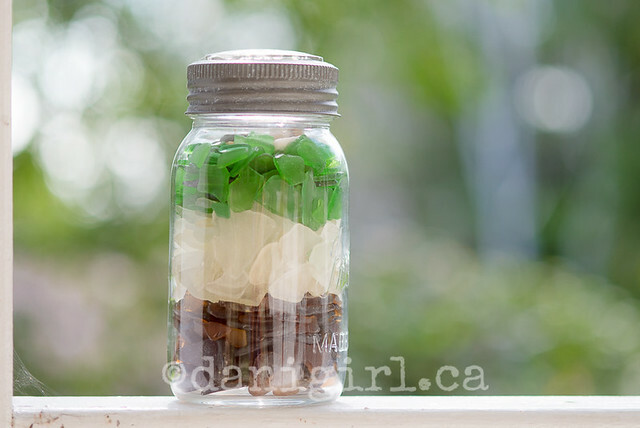 Just a few days ago, I blogged a few more of my favourite indoor activities, including bead crafts and scavenger hunts. If you’re feeling like comfort food, how about baking up some rainbow cupcakes? Or maybe just whipping up a batch of home-made playdoh? It’s pretty easy to pass the day with older kids, but sometimes not so much with babies, toddlers and preschoolers. Conveniently, my friends at Fisher-Price just shared this awesome new tool for inspiring playtime with your kids. I remember how hard it was coming up with ideas on how to play with a baby, especially when Tristan was a newborn, but there are dozens – maybe even hundreds – of great suggestions here on games to play with kids from newborn to school age. From the simple idea of tummy talking for babies under 3 mos to the classic “red light, green light” for toddlers to storybook theatre for older kids, there are tonnes of great ideas. I like how each game also has information about which learning skill you’re stimulating and even some basic safety cautions. Wouldn’t this be a great tool for a young babysitter looking for ways to interact with kids as well? I really wish I’d had access to this when I was a new mom! As I’m writing this post, I’m remembering how long those early days could seem, home with a baby who couldn’t entertain himself with Super Mario Bros or endless episodes of Max and Ruby. Isn’t it funny how while you’re in them, it seems like those days will never end and suddenly you realize that they’re long behind you? 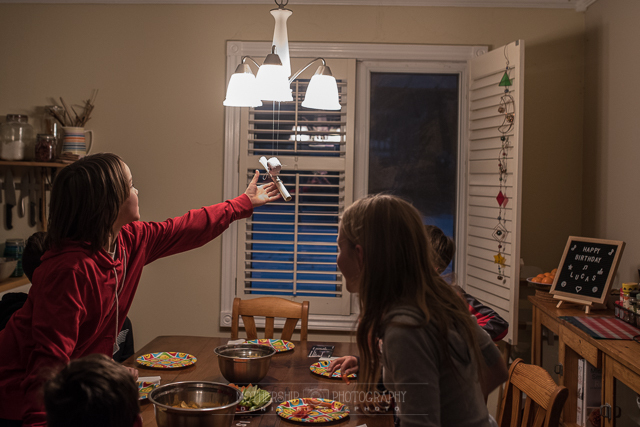 If you could make one suggestion to help another parent pass a long winter day at home with the kids, what would it be? Best idea for Halloween neighbourhood fun ever! Friday Family Fun: Movie night! And, a giveaway! Friday Family Fun: Back yard camp out!